Today is the final day of our new cake series, EEEK It’s Halloween Week! Five talented bakers were asked to create new designs inspired by Halloween. To bring the spirit of the holiday to life in a modern cake design like none we had seen before. Each baker was given a basic black and white color scheme and a specific genre, creating a week of inspiring cakes for everyone. We’ve seen everything from whimsical to couture…. but it is Halloween Week after all. So today we have something a little darker. It’s time for the Vintage Goth category! This fifth Halloween cake comes to us from Erin Gardner, owner of Wild Orchid Baking Company in North Hampton, NH. You may remember Erin from previous features on our site (like her rainbow cake and her vintage bunting cake). Erin has a talent for transforming trends into sophisticated cake designs and today’s feature is yet another great example of this skill. Erin’s design is delightfully dark and transcends us into a scene of tall candelabras, wax-dripping candles and heavy black curtains. A world where black orchids, black petunias and inky fingers are the flowers of choice. Where graveyard-inspired iron fencing is covered in cobwebs and a menacing skull is on display. 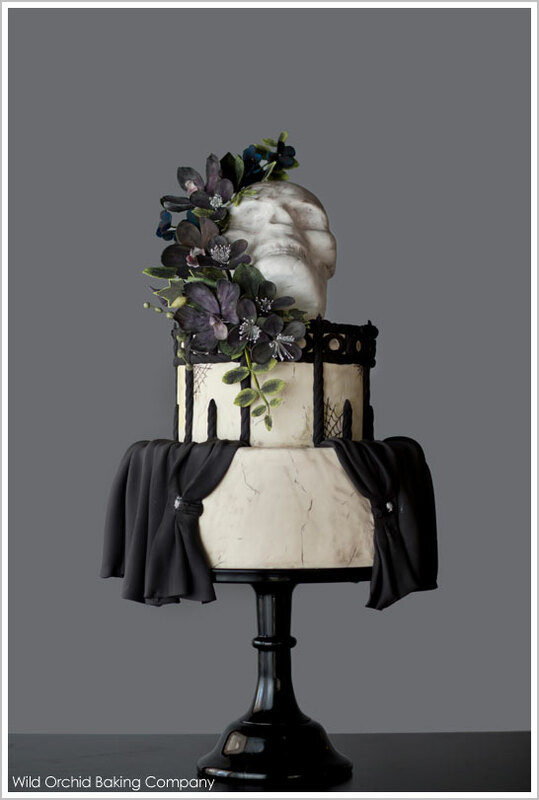 Erin’s cake is a fabulous cross between beautiful and foreboding, creepy and cool. Refined yet frightful, it’s a Vintage Goth Halloween Cake! EEEK! Can you believe this cake? I’ve been looking at it for days now and I’m still in awe! How can something so dark be so sophisticated? 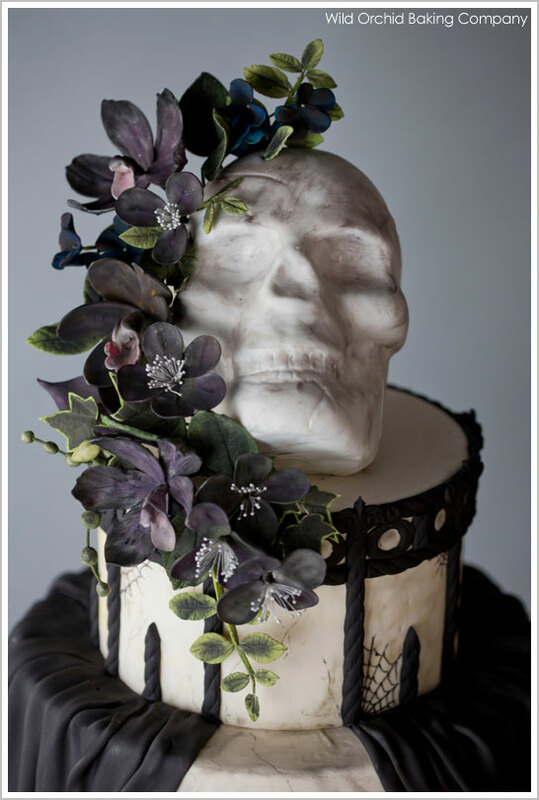 It’s quite possibly the most elegant cake to include a skull, ever! 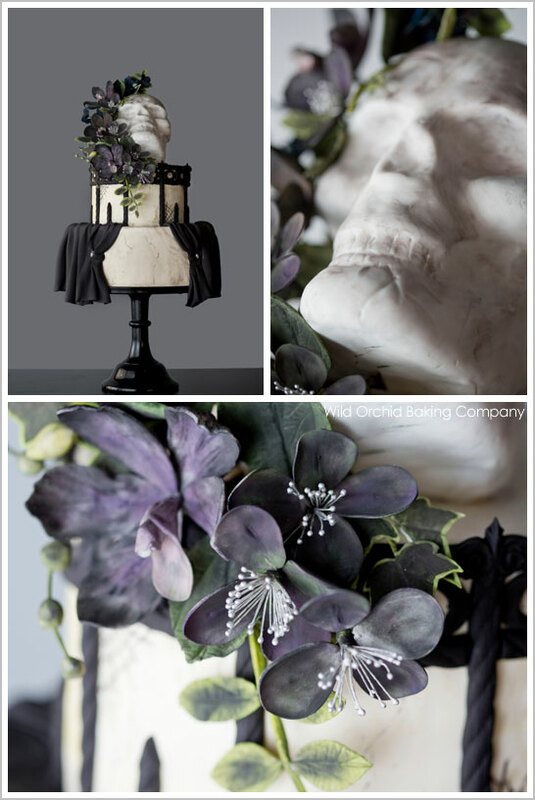 And the sugar flowers are insanely gorgeous with their black and grey tones, intensified with deep shades of purple. It’s eerie and spooky and down right spectacular! Let’s get a better look, shall we? Erin was going for gothic chic and she certainly nailed it! This cake is so crazy cool! It’s dark and eerie and simply captivating. Can’t you just imagine a fabulous, adult-friendly Halloween bash with this cake as the centerpiece? It would be frightfully a-ma-zing, just like this cake! Thank you, thank you to Erin of Wild Orchid Baking Company for creating this spectacular Vintage Goth Halloween Cake for us! And to Mark Davidson for the gorgeous photography! Oh, and if you’re keeping track of promises…. yes, there is still a new DIY headed your way. Coming to the blog later today!! Happy Friday! Wow!!! Amazing details. Love love love the flowers! Now that’s a Halloween cake! Awesome!! Oh wow! Spectacular. Beautiful beautiful cake. I woulda loved a couple of gargoyles at the main gate. It’s amazing how everything is edible. 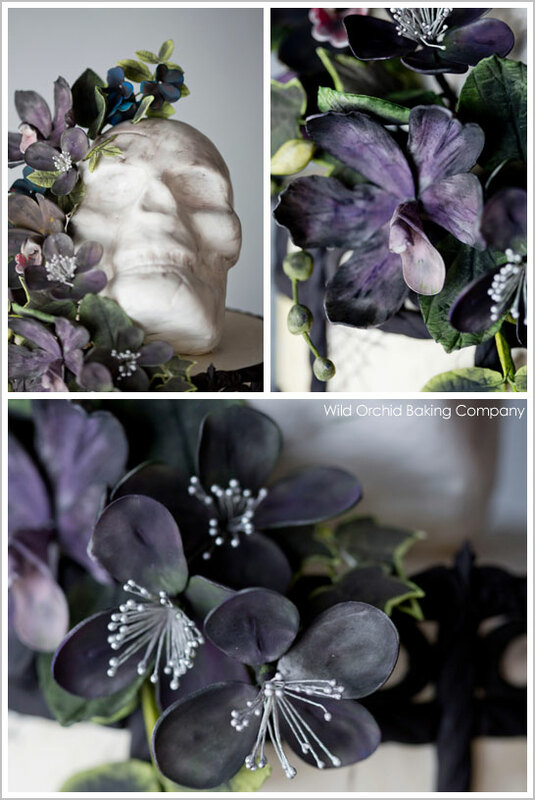 The orchids look so real and the skull is just amazing! Erin, you knocked this out of the ball park. Brava!